Good Morning all My Beautiful Gypsy Lovers…. I hope you are keeping warm if you are in my area… as Fall has hit. Brisk Cool Mornings… Brisk COLD Nights~! !~ After riding with T, helping his Ma with suppers…& well not being in the combine, I realized how lucky I was to sit in there with my hoodie & heater, as I froze my little buns off last night helping T move bins! 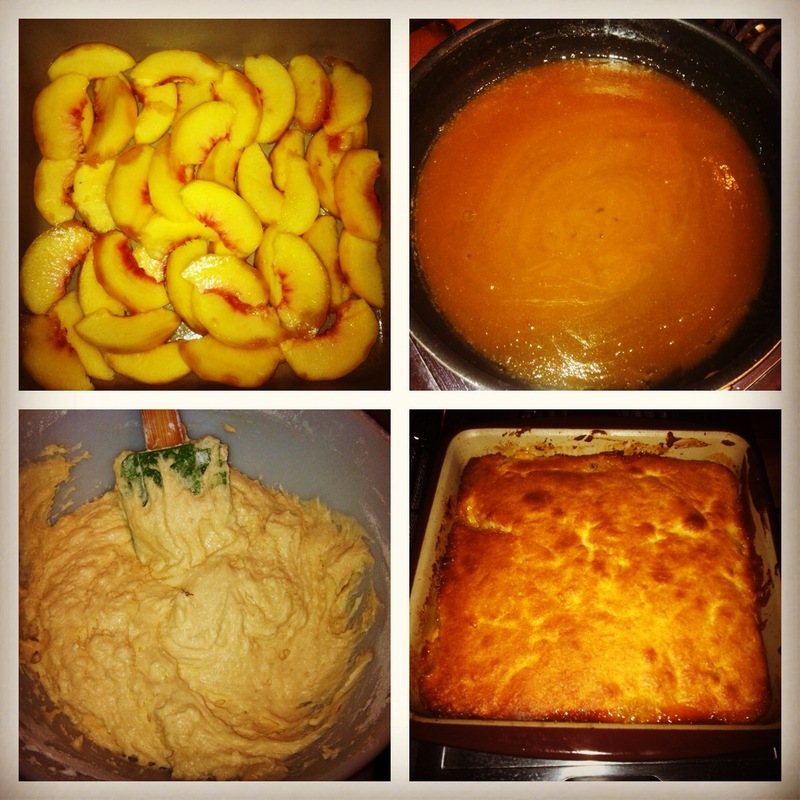 When I got home last night I whipped up an UpSide Down Peach Cake! I was so nervous & almost in tears because I didn’t want it to fail (Reason 110 why I don’t bake often or at all… It usually is a Disaster!!) But my Gramma made this for us through harvest & it was soooooo delicious that I had to have it again!! Peel & slice peaches. Place in a nice arrangement on the bottom of you pan. I used a square stoneware pan (Pampered Chef, Love it & use it all the time!!). Next in a a frying pan add the butter & brown sugar. Heat until the sugar has dissolved & the mixture starts to bubble. Remove from heat. Turn oven on to Bake 350. Next make your cake!! Since I’m not a baker I had to hand mix the cake.. this part was a little nerve racking for me at first because I wanted to make sure I had the right consistency..then I realized… “Hey this isn’t that hard!” 😉 So first mix the butter & the sugar until fluffy… (I kept thinking to myself here… IT’S SO FLUFFFFFYYY! !” from Despicable Me). Next WHIP in that Vanilla. Then Add 1 Egg… slowly mix it in… Then add Egg number 2! Next add all your DRY ingredients in a separate bowl & mix. Then add HALF of the dry ingredients into the wet mixture… next add your milk… then add the rest of your dry ingredients. NOW…. Drizzle the brown sugar mixture over your peaches…. Then add the cake batter. Smooth the cake batter all over the peaches. Then throw it in the oven. I baked mine for 45 minutes & it was perfect!! (or so it looks… I have not taken a bite yet). But as long as the cake had pulled away from the edges & when you stick a fork or toothpick in the middle no raw batter comes up. So pending on your oven it can bake anywhere from 45-60 minutes. Then finally when its done, pull it out & let it sit for 20 minutes or so to cool. Then if you wish (I’m not trying this) you can flip the cake upside down onto a serving plate… this will display your beautiful peaches & carmelization! TaaDaa… its that simple. The only reason why I am not attempting the flip.. is so far I have not failed on this recipe & I feel that could be a clumsy disaster for me… & secondly I will be hauling this out to the field so it will be easier to transport this way. Hope you all enjoy this beautiful Fall weekend! !